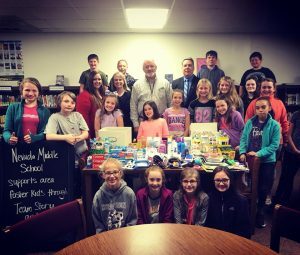 A group of students from Nevada Middle School recently took on collecting supplies for local foster kids. In 2017, Story County had 65 children placed in foster care. Children in foster care may have little to no items to call their own as they move from home to home. The Story County Attorney’s Office along with Team Story led the charge to collect items like crayons, stuffed animals, personal hygiene products, art supplies, and more for ages 0 to 18. The amount of items our NMS students donated overwhelmed County Attorney Jessica Reynolds. “You have reaffirmed what I already know to be true…that it doesn’t matter your age, or your size, all that matters is how how big your heart is – and that you use it to help others. Thank you for making the world a better place by helping our local foster children” remarked Reynolds to the NMS kids upon presentation of the donations.